Who says you cannot pair wine with asparagus? Rosé, the most versatile of wine styles is fantastic with these adult “grilled cheese sandwiches”. Open-faced with asparagus, prosciutto and three layers of melted cheese, this elegant croquet monsieur is gooey, crunchy and delightfully satisfying. Serve as a canapé, or atop a bed of fresh arugula salad as an entrée. A dry Rosé is a classic pairing with charcuterie. 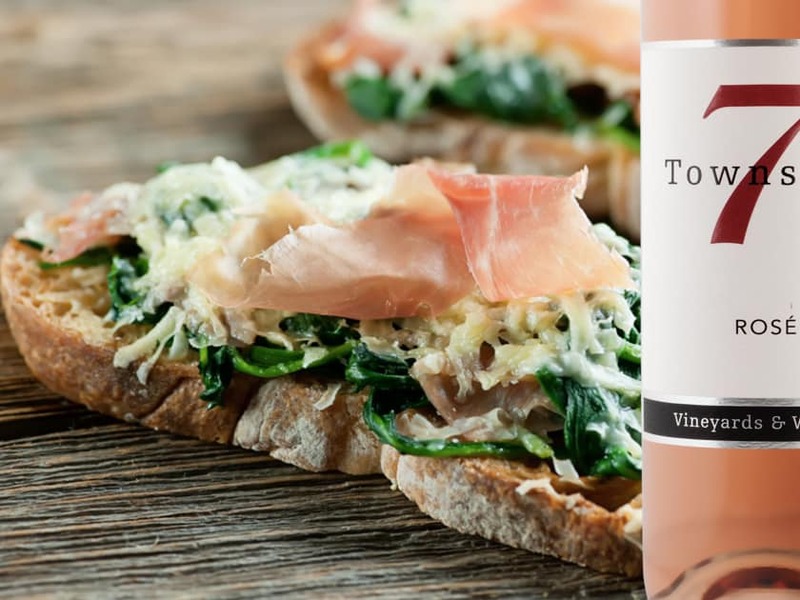 This velvety, warm version with crostini, melted cheese, salty prosciutto and crisp asparagus is the ideal match for our fun and fresh, Provençal style wine. Perfect for spring and summer! Cook asparagus until crisp-tender. Drain, set aside. Wipe skillet. Add oil and cook shallots in skillet over moderate heat until softened. Set shallots aside. Cook tomatoes in skillet, over moderately high heat until lightly browned, set aside. Toast bread in broiler. Spread toasts with tapenade, top with shallots, fontina & mozzarella. Broil tartines until cheese melts. Top tartines with asparagus & Gruyère, season with salt & pepper. Broil tartines until Gruyère melts. Top tartines with tomatoes & prosciutto, drizzle with vinegar. Serve with our well-chilled 2017 Rosé. Wine Club, Culinary Events, Newsletter, Wine Releases, Special Offers and more!